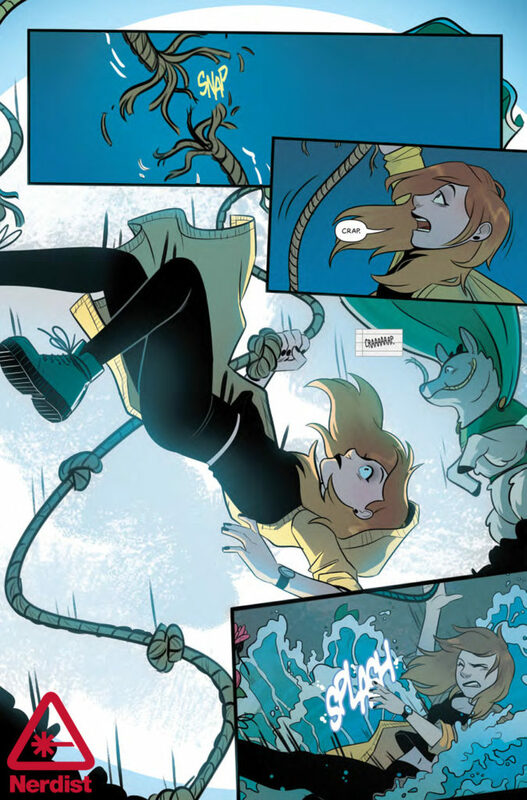 Nancy Drew has long been one of the most iconic young adult properties out there, so fans were understandably excited when Dynamite Entertainment announced a new Nancy Drew book with Kelly Thompson and Jenn St-Onge at the helm. It's a powerhouse pairing of two of comics' most dynamic names, with a rare all-female creative team that's rounded out by colorist Triona Farrell and letterer Ariana Maher as well as some great variant covers from Annie Wu, Tula Lotay, and Marguerite Sauvage. I chatted with Thompson and St-Onge about bringing Nancy to life, creating comics together, and making the art form accessible. St-Onge and Thompson first collaborated on the cult hit spin-off miniseries Jem: The Misfits, and the pair were desperate to work together again. Luckily, the perfect opportunity arose. "Editor Nate Cosby approached me about a couple properties he thought I might be interested in developing into a new series for Dynamite," Thompson told Nerdist. "Nancy Drew was the one that instantly stood out to me as a great fit and super exciting to tackle." It didn't take long for Jenn St-Onge to climb aboard as well. "Kelly messaged me with the opportunity to pitch a Nancy Drew book with her and I was so excited to get a chance to create my own version of a character that really meant a lot to me as a kid," she said. "I wanted to create a heroine who still retained the spirit of the classic stories, but also felt like an updated version that could believably exist in 2018." When Nancy Drew was announced at ECCC, I was delighted that the creative team was made up entirely of women. This is rare in comics in general, but especially uncommon at Dynamite. For the team, it's something integral to the core of their vision of Nancy Drew. "This is a comic that we very much want to strike a chord with young female comic readers, so I think having an all-girl team will really allow us to tap into an aesthetic/sensibility that connects with that demographic," St-Onge said. Thompson was quick to shout out their collaborators on the new title too: "I'd like to mention the rest of our team, since we're talking about them," she said. "We've got Triona Farrell on colors and Ariana Maher on letters, and they are just doing incredible work. I certainly echo Jenn that it's an awesome thing to see, especially for impressionable young girl—a badass book about Nancy Drew that's by all female creatives." Fans of Thompson will know she's no stranger to detective stories, with her beloved run on Marvel's Hawkeye focusing on another young woman with a nose for mystery. "Obviously there's some research that comes into play for modernizing iconic and beloved characters like these," she said. "But mostly I just have to treat it like any other detective story, which is to say, until you 'figure it out' it's basically the hardest kind of story to do. Usually with a detective story, I work backwards, to a degree—at least for my outline—so I can seed everything where it needs to go for it all to payoff. Beyond that, I think it's all about updating it to feel young and fresh, while still holding onto the things that make Nancy Drew—and team!—such icons." As for the visual landscape of the new Nancy Drew, the creative team had a clear vision. "We wanted to create a world that was modern but also a bit sleepy—like you can tell that it takes place in present day but there's still a mysterious, small-town feel to it," St-Onge said. "There's definitely something bubbling beneath the surface in Bayport, and the quiet façade of both the town and the people are hiding things from Nancy." A big fan of Nancy Drew growing up, St-Onge has clear memories about just what spoke to her about the classic stories. "I had the yellow Mystery Stories series of Nancy Drew as a kid, [which] maybe had 10 stories collected included in it, that I just reread over and over again," she said. "It appealed to me for the same reason that Nancy appeals to a lot of people who read it. I wanted a story where the mysteries got solved by a clever girl with the help of her friends." Meanwhile, Thompson likewise has a very relatable reason for looking forward to working on Nancy Drew: her mom. "One of the most exciting things for me about doing this book is that my mother doesn't particularly care about superheroes," Thompson said. "She's always been incredibly supportive of my work, but it's hard for her to personally get excited about the X-Men or the Avengers. But with Nancy Drew she's very personally excited. So I've finally arrived. Thank god!" As for what fans should be most excited about, Thompson has a clear idea of her main goal with the book. 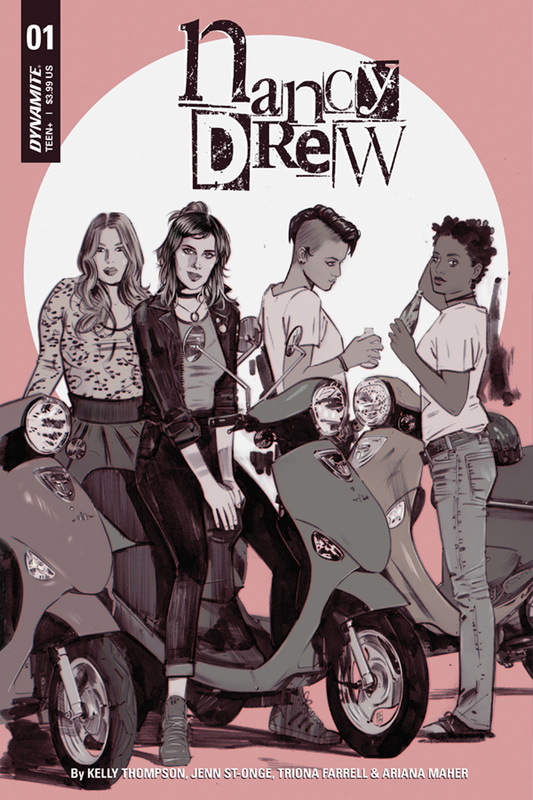 "Voice is really important to me in comics, and with a character as iconic as Nancy Drew, it's a fine line to skate," she said. "What feels authentic, even in a modern version, and what's something that I can bring to the table that makes it memorable. Finding the balance to those things is always what I'm looking for and what I hope makes readers fall in love." Are you excited to see the girl detective back in action? Just stoked to see St-Onge and Thompson together again? Let us know below! Where's our Locke & Key TV series?